Chris Johnson, co-pastor of First Baptist Church in San Antonio, Texas, contrasts a six-second cursory search to a serious, all-out search for God when facing difficult days. He reminds us God has a long view, seeing decades ahead and calling us to go beyond cursory searches guided by self-centeredness to faithful obedience of God. 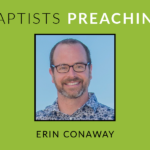 This sermon was delivered during the morning worship service at First Baptist Church in San Antonio on July 15, 2018 as part of the Rescue and Redemption Summer Sermon Series. Audio of this sermon is available here. The manuscript of this sermon is available here.